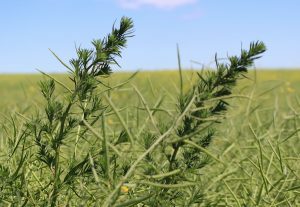 Surviving weeds are growing strong and some of them — like kochia and wild oats — start to look really obvious by this time of year. Patches that seem to be maturing early while the rest of the crop is still green do warrant closer inspection. With all the rainfall in some areas, die-off due to excess moisture could be the prime suspect — but check anyway. It could be disease. If it does not straighten up, the result can be higher levels of sclerotinia stem rot and harvest challenges. 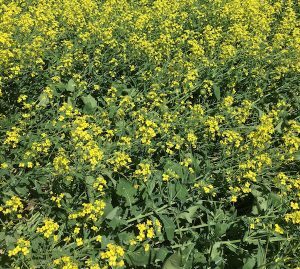 Some of the earliest canola fields will show seed colour change over the next two weeks. For those growers, we provide this short primer on swath timing and straight combining. 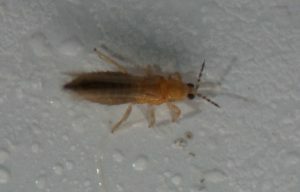 Three thrips species will feed on canola in Canada and only one — western flower thrips, (Frankliniella occidentalis) — causes pod curling. 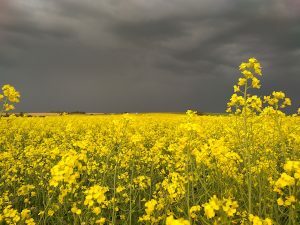 Heavy rains can increase the sclerotinia stem rot risk but they also make fields too wet for ground sprayers. This can delay timely applications, especially because demand for aerial applicators can make for long wait times. Here are scenarios that may help you work through this situation….